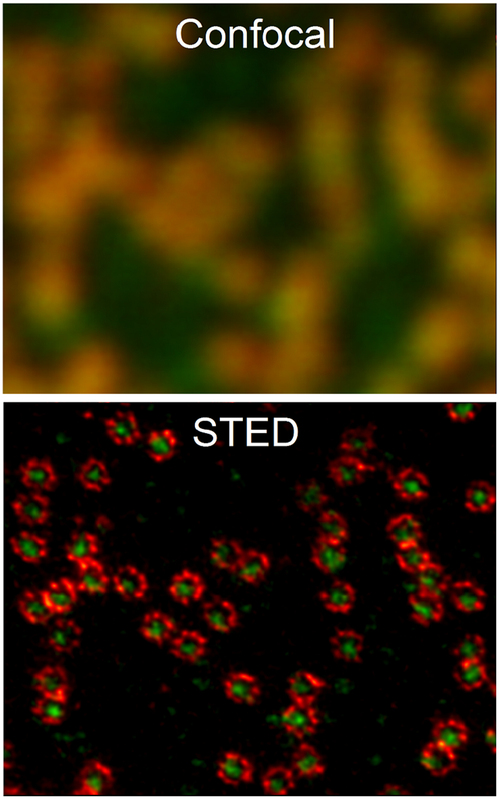 Nuclear pore complexes in an intact cell nucleus imaged by dual-color STED nanoscopy at ~20 nm spatial resolution from Stefan W Hell et al 2015 J. Phys. D: Appl. Phys. 48 443001. Image courtesy of Abberior Instruments GmbH. The roadmap covers a wealth of topics associated with super-resolution microscopy, including the use of adaptive optics, optical calibration using DNA-based reference samples, and using fluorescent nanobodies as protein tags to name a few. You can read the roadmap here and hear more from Professor Eggeling and Dr Bates on medicalphysicsweb: Beyond the diffraction limit: super-resolution microscopy.